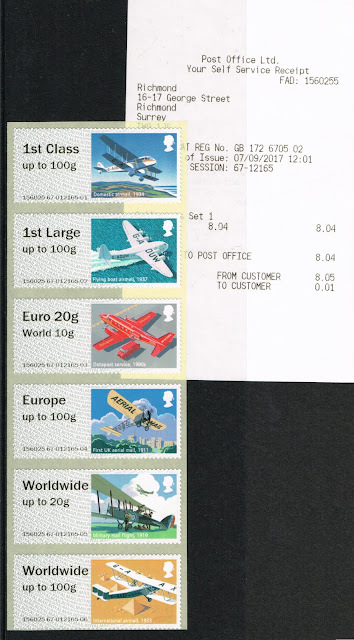 Stampex Stamp issues announced: Mail by Air, Ladybird Books. We are now able to show the two stamp sets which will be issued during Autumn Stampex which this year runs from Wednesday 13 - Saturday 16 September at London's Business Design Centre in Upper Street Islington. Both issues are now shown in detail on our website. The latest Post and Go set is Mail by Air, which consists of the familiar set of 6 designs depicting key stages in the carriage of mail by air, from the first UK Aerial Post from Hendon to Windsor in 1911, through to the use of aircraft in the Datapost livery in the 1980s. I particularly like the Imperial Airways HP42 flying over the pyramids of Egypt and the Short flying boat. The stamps will be issued on 13 September and the write-up for them is on this webpage. UPDATE 13 September: My thanks to those who have written about the year coding on these which DP didn't notice and neither did I, on the stamps pictured below! The year code is no longer M17L but R17YAL. UPDATE 11 September: DP reports that the new stamps were installed in Richmond, Surrey last week - but when he went back for more they had been replaced. The second set will be issued on 14 September and depicts Ladybird Books. I don't know why: there is no apparent anniversary and Royal Mail have not really justified it. (Read more on our webpage here.) The good news for users and collectors is that there are two 2nd class stamps in this set, just over a year after the last 2nd class special issues for Landscape Gardens. The good news for those on a tight budget is that there is no prestige stamp book, which there often is with the Stampex issue. Whilst I do like many of the modern thematic issues - which usually offer opportunities to create maximum cards however difficult that might be in some cases - I do wish more stamps were issued with at least a passing acknowledgement of a specific anniversary or occasion. Postcrossers will bemoan the absence of a postcard stamp but if they use really small writing they will be able to get these two stamps and a 5p stamp to make up the postcard rate of £1.17! Those Ladybird Books stamp issue is a bit of a random release, they could have had a set of stamps on the Postal Museum instead of the Commemorative Sheet. Hoping some news on the October issue this week as the New Bulletin is due out this week, which should shed some light on the October stamp set. Sadly it doesn't. There may we'll be some news around September 4th, but I don't know whether that will come from Royal Mail itself or via one of the FDC producers' websites - which is the hint for you all to look at them around that time! "The company [Ladybird Books] traces its origins to 1867, when Henry Wills opened a bookshop in Loughborough, Leicestershire." The 150th anniversary of this event might well be considered justification for a stamp issue, even though the Ladybird imprint itself didn't come into being until 1914, but without a bit of explanation (from Royal Mail) I admit I also engaged in some head-scratching to try to discern the reason for its timing. I forgot what the options were for the survey in March Royal Mail issued about the 2019 possible stamp issues, but the areas were history and transport, arts, literature and architecture, science, sport, and the natural world.. I also used the suggestion box but doubt they'd take notice (although I did spread the word to Postcrossers and expect Royal Mail had quite a few suggestions for that hobby). I did have an address (but now forgotten) to send stamp suggestions to Royal Mail. I wonder if other stamp producing postal authorities encourage public input of suggestions for stamp issues. An Post certainly does although for 2019 suggestions, the closing date for submissions was end of March 2017, I guess towards the end of the year, they'll be wanting submissions for the 2020 programme. Having looked at these Stamps today, the Security Year Code has changed. It used to be 'MA17' etc, but this issue the year code has moved into the word 'Royal' - 'R17YAL'.